A thermometer desk clock with alarm and snooze function displays the weather, time, date, day of the week, humidity and temperature in Celsius or Fahrenheit. Size: 2 7/8"w x 5 1/2"h Imprint Area: 1 1/2"w x 3/8"h Optional Imprint Area: 1 1/2"w x 5/16"h. Carton Size: 12" height x 17" width x 14" length Carton Weight: 31 lbs/100 pcs Individually packaged in a white box. Complete gift set featuring our PhotoVision series items Dual function time & weather station calculator Metal business card holder Gift set includes black velvet gift bag with metal key ring Durable polyurethane dome keeps logo protected on all 3 items Actual Size: Business Card Holder: 2-3/8" H x 3-5/8" W; Calculator/Clock: 4-1/2" H x 2-1/2" W; Key Ring: 7/8" H x 3" W Imprint Area: Business Card Holder: 5/8" H x 2-1/8" W; Flipper Clock/Calculator: 5/8" H x 1-1/4" W; Key Ring: 5/8" H x 1" W Packaging: Bulk. Individually poly-bagged Shipping Weight: Approx. 13 lbs. per 25. 8 Musical Tunes. Full Calendar Display. Low Power Consumption. Birthday Reminder Alarm. Alarm/Snooze. Countdown Timer. Time and Date Display. Temperature Display. Imprint Area: Bottom 3/4"h x 1 1/4"w Packaging: White Gift Box Pieces Per Box: 40 Weight Per Piece: 0.70 lbs. Weight Per Box: 28 lbs. Case Dimensions (L x W x H): 18 x 10 x 13. Powered by AC/DC - DC power adapter included. Includes indoor hygrometer, indoor thermometer, multiple weather icons (sunny, slightly cloudy, cloudy, rain) with 12 hour temperature trends. 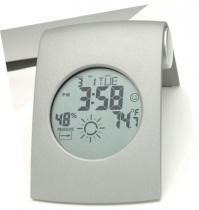 Max/min memory for hygrometer and thermometer, perpetual calendar, 12/24 hour display, snooze alarm clock and back light. Product Size (H x W x D): 5.50 x 1.50 x 3.13 Imprint Area: Below Display 1 3/8"h x 2 3/8"w Packaging: Gift Box Pieces Per Box: 60 Weight Per Piece: 0.48 lbs. Weight Per Box: 29 lbs. Case Dimensions (L x W x H): 22 x 17 x 13. Included is 12/24 Hour Format. 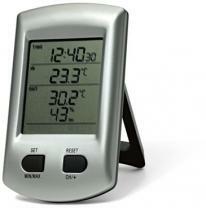 Indoor/Outdoor Thermometer Display (C/F). Calendar with Week and Day Display in 7 Languages. 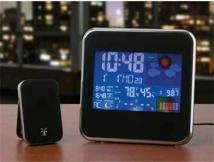 Alarm, Low Battery Indicator and Temperature Alert, View Your Outdoor Temperature From Indoors. 433 MHz Transmitter Frequency with a Range of Up To 30M/100Ft. Product Size (H x W x D): 0.75 x 3.00 x 4.75 Imprint Area: Bottom of Front 1/2"h x 1 3/4"w Packaging: White Gift Box Pieces Per Box: 40 Weight Per Piece: 0.58 lbs. Weight Per Box: 23 lbs. Case Dimensions (L x W x H): 16 x 15 x 12. Desktop Weather Station With Aluminum Cover And Wood Trim. Size(s): 7 3/4 X 3 3/8 Imprint: 2 X 1/4 Additional Information: Prices include one color, one position imprint. Powered by AC/DC - DC power adaptor included. Displays multiple weather icons (sunny, slightly cloudy, cloudy, rain) with 12 hour temperature trends in C/F. Includes digital hygrometer, min/max memory for hygrometer and thermometer, perpetual calendar, 1/24 hour display, snooze alarm clock and back light. Product Size (H x W x D): 3.38 x 1.50 x 4.75 Imprint Area: Below Display 9/16"h x 3"w Packaging: Gift Box Pieces Per Box: 40 Weight Per Piece: 0.63lbs. Weight Per Box:25 lbs. Case Dimensions (L x W x H): 22 x 11 x 9. 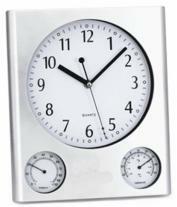 Collina 3 Display Hydro-Temp-Clock/ Matte Silver With Mint Glass. Desktop analog weather center, clock & alarm. Finish/Material: Acrylic, Aluminum Dimensions: 8.00" W x 3.25" H x 0" D Imprint Area: 2.000" W x 0.375" H Shipping Information: Carton Size: Box Length: 8.00 Box Width: 3.00 Standard Packaging: Individually Carton Weight: 27lbs / 24pcs. 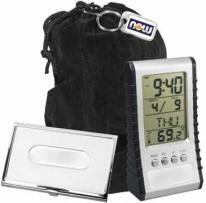 Easy access to instant weather information - great for home, office or travel. Multi-function features include month/day/year calendar, temperature (in Fahrenheit or Celsius), FM radio and alarm clock with snooze button. Strong LCD display for easy viewing. 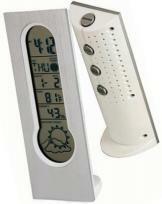 Remote outdoor thermometer with temperature display on main unit. Packaged in durable EVA storage case. Mercury free battery. Fabric/Material: EVA molded foam Size: 6.5"L x 3.75"H x 3.5"W Imprint Area: Spine top front panel center 3"W x 2.25"H Spine left front panel center 2.25"W x 3"H Spine left front panel upper center 2.25"W x 1.5"H Shipping Information: Carton Size: 21"L x 6"H x 18"W Quantity: 10 Weight: 9 lbs. 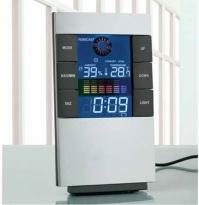 Easy Access to instant weather information-great for home or office. 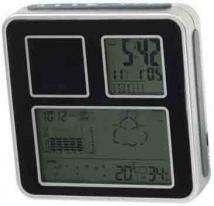 Displays time, monitors and keeps track of indoor/outdoor temperature (Fahrenheit or Celsius) and outdoor humidity. Kit includes: wireless weather station, wireless outdoor sensor that transmits data up to 300 feet, 2 AA batteries, 2 AAA batteries, and one-peice gift box. Mercury free battery. Fabric/Material: ABS plastic. 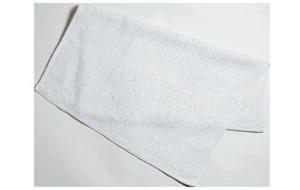 Size : 2.625"L x 4.5"H x 1.125"W. Imprint Area: Top Panel Center 1.5"W x .25"H Pad Print 2 Color. Shipping Information: Carton Size: 21"L x 6"H x 18"W Quantity: 38 Weight: 25 lbs. Clock in metal case with adjustable viewing angle Colorful Hi-Gloss, piano finish wood Clock, thermometer, & hygrometer Size : 7 1/4" x 4 1/2" x 2 3/4" Imprint Area : 1 1/2" x 3/4" on wing; 1" x 1 1/2" on metal base PCS/LB : 30/22. Internet weather and news station. Customize display with any worldwide desired stock index, choose local or worldwide weather and scrolling headline news, displays indoor/outdoor temperature, time, alarm, day and date. This item can sit on your desk, hang on the wall and has a magnetic backside. Product Dimensions: 4.3'' H x 5'' W Imprint Dimensions: 0.4 ''H x 3.5'' W Packaging: Gift Box Carton Dimensions : 17''x13''x11'' Shipping Weight: 40/24 Note :Price includes 1 color, 1 location imprint. 2 color logo: minimum 48 pieces. 3+ color logo: minimum 72 pieces. Other decoration methods are available for this item, please call for details. Predicts max/min temp for 5 days, UV intensity indicator, displays in 7 languages, 12/24 format, temperature in C/F, dual alarm and snooze function, Includes updated software and USB transmitter. This weather station features 5 day forecast (current day and following 4 days), time, alarm and calendar function. 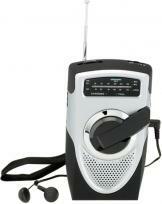 Keep the transmitter plugged into your computer to get current weather report updates on the wireless weather station with a radio frequency range of 30 m. Works with Windows 2000 and XP PC only (not Mac or Vista). Product Size (H x W): 7.25 x 3.00 Imprint Area: Below Display 1/2"h x 2"w Packaging: Gift Box Pieces Per Box: 40 Weight Per Piece: 0.63 lbs. Weight Per Box: 25 lbs. Case Dimensions (L x W x H): 16 x 15 x 9. 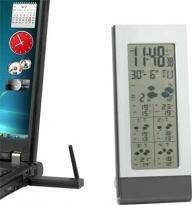 The weather and more ... 1.5" digital photo frame and weather station in one. Stores up to 50 photos. 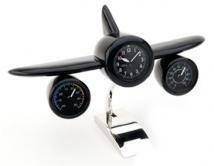 Includes a built-in barometer which predicts the weather for the next 12 to 24 hours. Includes calendar and alarm clock. Print Area: 2.75" x 0.19" Product Dimensions: 4.09" x 4.09" x 0.98" Packaging: White giftbox Packaging Dimensions: 6.69" x 4.6" x 1.69" Weight Product: 0.49 lbs Weight Product & Box: 0.69 lbs Compliance: CE Features: Weather forecast for the next 12 to 24 hours Calendar function Alarm clock Digital photo display Snooze function. Host Interface: USB 2.0 File Support: BMP, JPG, GIF Power Source: USB 5V power supply Display: 1.5" CSTN LCD screen Photo Storage: Stores up to 50 photos Accessories: Instruction manual, USB cable and CD. 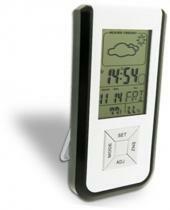 Includes indoor/outdoor thermometer. 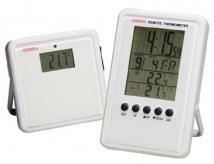 indoor/outdoor hygrometer, temperature display in C/F, max/min memory for hygrometer and thermometer, and multiple temperature trends. Displays a full weather forecast using icons with barometric pressure trend indicator and moon phase indicator to detect high/low tides. 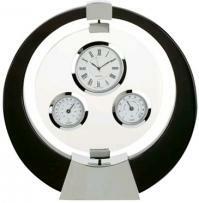 Also offers perpetual calendar, 12/24 hour display, back light, alarm with snooze function and sunrise/sunset times. The wireless remote outdoor sensor will transmit data from up to 100 feet. Powered by AC/DC - DC power adaptor included. Includes two AAA batteries for sensor. Product Size (H x W x D): 6.25 x 2.38 x 6.25 Imprint Area: Base 1 1/4"h x 1 1/2"w. Packaging: Gift Box Pieces Per Box: 20 Weight Per Piece: 1.05 lbs. Weight Per Box: 21 lbs. Case Dimensions (L x W x H): 15 x 14 x 14. Desk clock & weather center. Finish/Material: Metal Dimensions: 4.50" W x 6.00" H x 0" D Imprint Area: 2.500" W x 0.500" H Shipping Information: Carton Size: Box Length: 4.00 Box Width: 6.00 Standard Packaging: Individually Carton Weight: 31lbs / 10pcs. An exquisite exhibition of form and function! 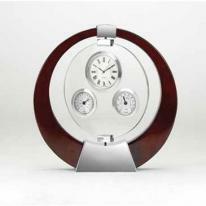 Clock, thermometer, and hygrometer look suspended in midair, as the rosewood and silver metal perfectly compliment each other. Approximate Dimensions: 7.5" H x 7.5" W x 2" D Imprint Area: .88" H x 1.75" W. Other decoration methods are available for this item, please call. Weight: 1.65 lbs.